This district, is not a state, rather a territory founded on July 16, 1790 to serve as the young nation’s federal capital. A new “federal city” was then constructed on the north bank of the Potomac River, to the east of the established settlement at Georgetown in Maryland, personally selected by President George Washington. Land for the district was partially from Maryland and from Virginia property. The original native Indians to that area were the Nacotchtank and Piscataway tribes, but with the Europeans (Germans, Swiss and English) who also settled in the 16th and 17th centuries in the Maryland and Virginia area, the Indians had soon moved into other regions. After the construction of some government buildings and borders set, the Organic Act of 1801 designated that citizens within the district were not citizens of Maryland or Virginia any longer, but instead residents of this federal territory. The population through much of the early 19th century were African-Americans; some were slaves, some freemen; an important note for the District of Columbia genealogy. By 1860 approximately 80 percentage of the African-Americans population in Washington were free blacks. Washington has had a significant black population since the city’s creation. Approximately 30 percent of the city’s population have remained over the decades as African-Americans. That figure climbed to 70 percent by 1970 and then started to decline as African-Americans moved out of Washington for other parts of the country. 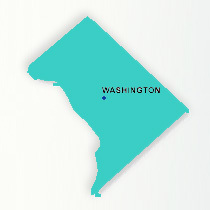 The overall population of the City of Washington in 1800 was 8,144 and that increased to 51,600 by 1850. In 1900 the city’s population, as well as its many governmental buildings, increased to 278,700 citizens. Over the years, people from across the United States and foreign nations have some to live in the District of Columbia. In 2010, the city’s total population is about 600,000 residents.